Eliminate bugs, tar, and sap FAST! Remove bugs, tar, tree sap, and sticky grime with our Bug and Tar Remover Kit. This is a year-round highway survival kit! The products in this kit remove all the bugs, tar, tree sap, and grime your vehicle accumulates on your travels. The Bug and Tar Remover Kit contains products to remove the grime and protect your vehicle in the future. Bugs and tar don’t stand a chance! Bugs and tar are unsightly, of course, but they are also extremely dangerous to your vehicle’s finish. Bugs produce acids that will etch the paint in a matter of days. Hot tar is highly corrosive, too. Tree sap leaves your vehicle bumpy and dirty-looking. The Bug and Tar Remover Kit makes it quick and easy to remove sticky grime and then protect the paint. A little preventative maintenance with the Bug and Tar Remover Kit will go a long way towards prolonging your vehicle’s beauty. When washing won’t do, use the Safe Scrub to eliminate bugs and tar once and for all. The Safe Scrub Pad has a honeycomb texture that lifts and removes sticky substances from your vehicle. The Safe Scrub is packed with pores that capture tar, bugs, and sap. Used with soapy water, the Safe Scrub is safe and nonabrasive on paint, metal, glass, and plastics. To thick pad is easy to handle with wet hands, and it has plenty of room to trap dirt and debris. Here’s a tip: soften the Safe Scrub more by soaking it in warm water for about 3 minutes. Zap bugs, tar, tree sap, and sticky grime on the spot! Stoner Tarminator is a strong bug and tar remover that instantly starts loosening and dissolving sticky contaminants. Tarminator uses “micro active” technology to break down the molecules in sap, grease, tar, and bugs. 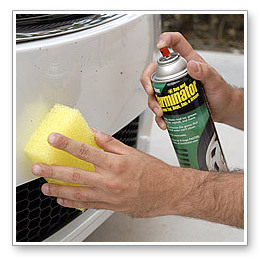 Spray Tarminator onto a clean microfiber towel and wipe the sticky spot until it comes clean. Tarminator works that fast. Use it on paint, glass, metal, and hard plastics. Removing bugs and tar requires some elbow grease. In the process, you may remove the existing wax. Use Wolfgang Deep Gloss Spritz Sealant to quickly apply a durable layer of polymer paint protection. This spray sealant creates a slick, shiny surface that is anti-static. In the future, bugs and tar will have a more difficult time sticking to the paint. Spray Wolfgang Deep Gloss Spritz Sealant on the freshly cleaned spot and use a folded Deluxe Jr. 600 Microfiber Towel to spread the sealant over the paint. Flip the towel and buff to a bright gloss. The Deluxe Jr. 600 Towel is an incredibly thick, fluffy weave of 70/30 microfiber. Silky microfiber fingers massage any surface to a glossy shine with zero risk of micro-marring. The towel features a soft microfiber edge and a removable sticker instead of a tag. Use the Deluxe Jr. to buff away Wolfgang Deep Gloss Spritz Sealant or any wax or quick detailer. You’ve heard that the best defense is a good offense? This is it. The Bug and Tar Remover Kit eliminates sticky contaminants quickly to prevent the impending paint damage. Your vehicle will look cleaner, feel smoother, and the paint will last longer when you use the Bug and Tar Remover Kit. A total retail value of $48.96. Save $13.97! Works as advertised on the dreaded LoveBugs.